Moon Phase Watches. They’re my latest obsession. 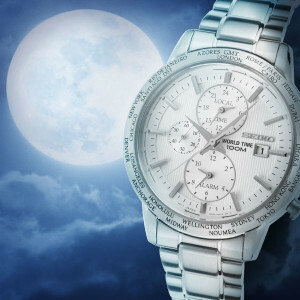 Combining my love for the moon and my love for watches and conveniently placing it on my wrist. These are among the most highly sought-after luxury timepieces in the world today. They’re available with mechanical, automatic and quartz movements and are magical because they follow the progression of the moon through her different phases… from new moon, first quarter through full moon to final quarter. 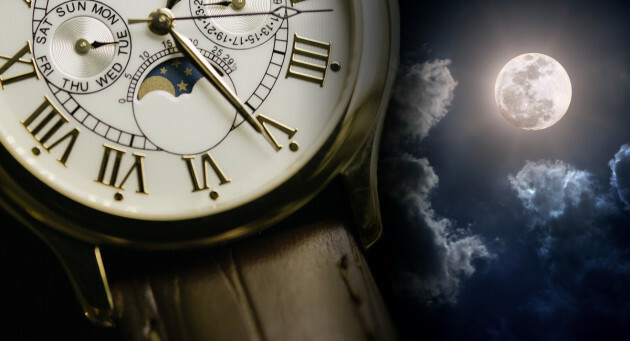 A watch with a moon phase feature displays the phases of the moon in a window on the watch dial. A rotating disc visibly presented through the aperture highlights the portion of the moon that can be seen from the Earth. This cycle from new moon to new moon displayed on the dial is designed to capture the actual 29.53 day real-life moon cycle. Some of the most prestigious watchmakers in the world, including Frederick Constant, Maurice Lacroix, Chopard, Omega, Lucien Piccard, and IWC offer moon phase watches in their highly regarded collections. Yep, there’s a full moon tonight. And I gotta tell ya, full moons are probably one of my top 5 favorite things in the world. I even made sure my wedding date landed on a full moon before booking it. What can I say? I can’t get enough. I can stare at her for hours. (Yes, the moon is a girl.) She’s just so beautiful and mysterious. I think it’s the mystery that draws people to her. Think about it: There’s this huge, gorgeous ball of white light in the sky, that shows us her full self only 12 times a year, she’s usually hiding some part of herself in the shadows and we know very little about her. That’s probably why there are so many myths about the moon. One of which is: Full moons make you crazy. Since ancient times, full moons have been associated with odd or insane behavior. From sleepwalking and illegal activity to fits of violence and of course, transforming into werewolves. Human misbehavior has been blamed on the moon for thousands of years. And for most of that time, doctors have believed there was a strong connection between mania and the moon. Hippocrates even wrote that “one who is seized with terror, fright and madness during the night is being visited by the goddess of the moon.” So, it’s no coincidence that the words “lunacy” and “lunatic” come from the Roman goddess of the moon, Luna. I mean, if you were on trial for murder in 18th-century England, you could ask for a lighter sentence on the grounds of lunacy if the crime occurred under a full moon. That’s how deep this myth ran. Every month, wherever the full moon lands, we kick-off our FULL MOON SALE. It’s when we go crazy and give you our lowest and best pricing of the month on brands like Seiko, ESQ by Movado, Michael Kors and so many more! Created by a planetary explosion about 400 billion years ago, the moon has comforted (wo)man for thousands of years. She’s been everything from a goddess to a compass. And now we’ve used her witchy powers to inspire a monthly sale at WorldofWatches, bringing you the best deals on all watches under the sun moon. Free shipping and free returns are included on all women’s and men’s watch purchases within the continental United States at WorldofWatches.com. I'm a Marketing Operations Manager and part-time blogger at WorldofWatches. I love watches, the moon, Broad City (watch it if you haven't) and have a slight obsession with my pups: Megatron (maltipoo) and Roary (morkie). Oh and, "The weirder the better."